I just saw this new project pop-up on Kickstarter this morning, and am really hoping it’s not an April fools joke…. This device will do everything that my home brew tracker can, but with increased form factor flexibility and Bluetooth LE. A product like this represents a major step forward in the commoditization of wearable hardware, and dramatically lowers the barrier to entry for new applications so that developers and entrepreneurs can focus on what matters… the data! 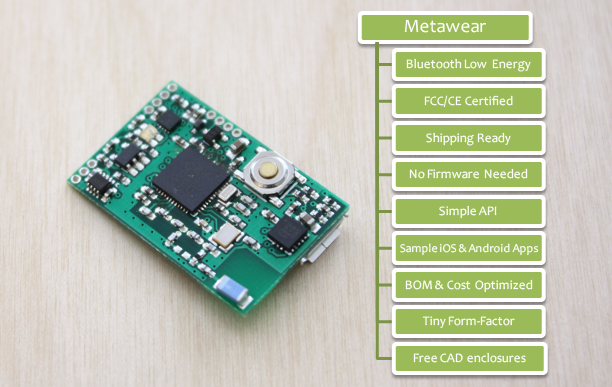 I wish MetaWear had been around when I started my blog, and I look forward to playing around with the first generation of hardware. Thank you to the MbientLab team for working to make open source activity tracking hardware a reality!